Ah, exercise bikes. We’ve talked a lot about them already here at Gym Blazer, covering different types of bike and price ranges. How about build size though? 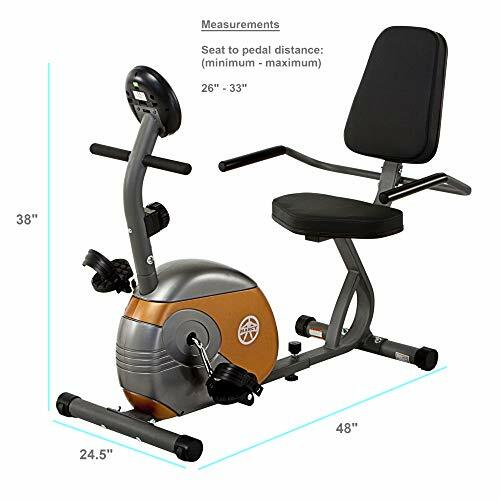 Well today I’m going to draw on all those years of gym experience and access to widespread feedback on various exercise bikes so that I can tell you what the best exercise bike for a short person is, and why. 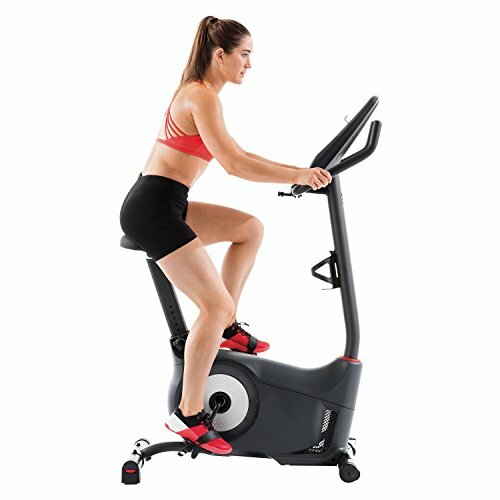 Hint: my top pick is the Sunny Health & Fitness Pro Indoor Cycling Bike. This isn’t the only option we’re looking at though. We’ve put together a list of the best options by bike type and a space-saving pick as well. Read on to find out more! 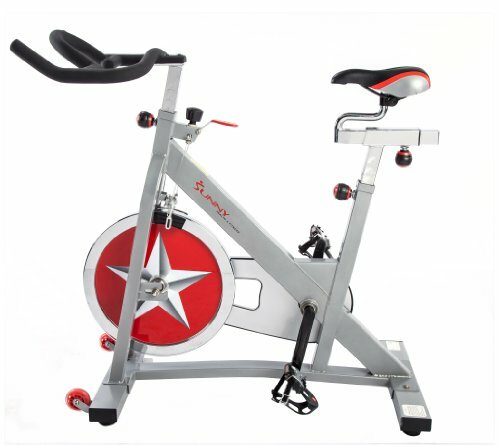 The Sunny Indoor Cycling Bike is a popular and high quality spin bike. 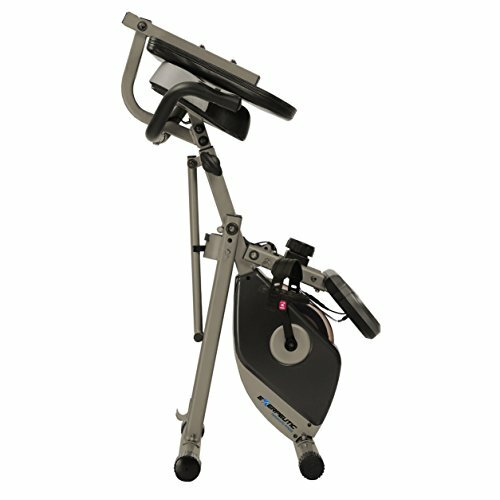 This isn’t the most advanced unit and doesn’t come with a massive list of extras, but it works great as a spin bike and has plenty of durability. 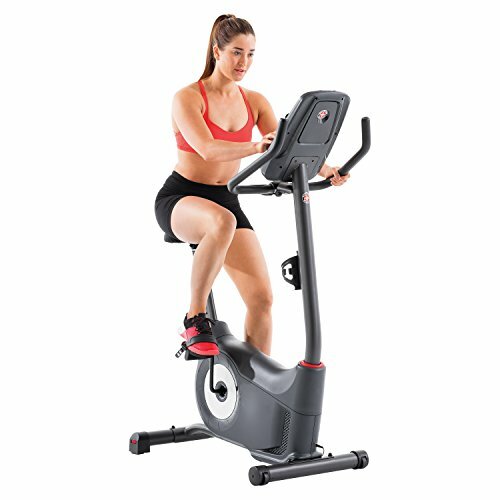 Spin bikes are the most realistic type of exercise bike, so this is a great choice for any competitive cyclists or those who are training for outdoor cycling events. 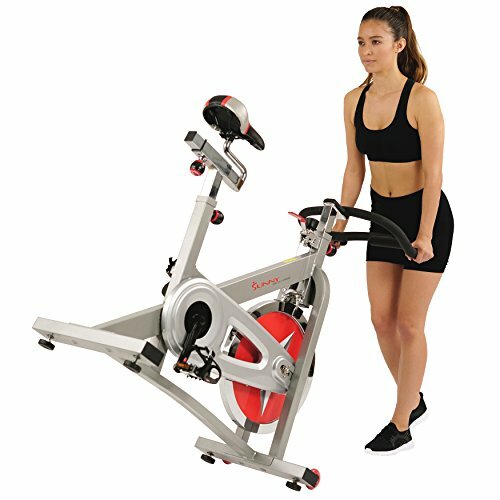 For more spin bikes, check out our articles on the best ones by Star Trac and Precor respectively. 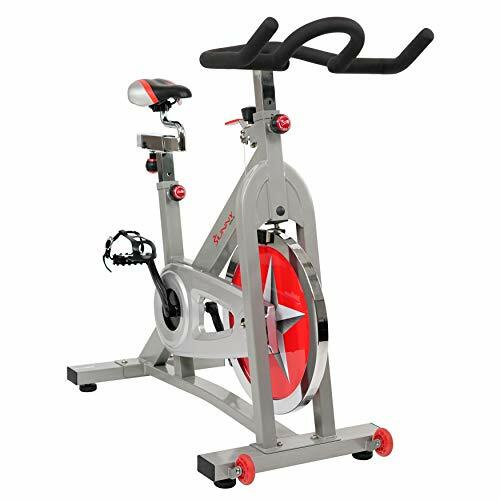 Like most spin bikes, this uses a metal flywheel and a magnetic system to create resistance. You simply turn the resistance knob to increase or decrease the resistance level, so there’s quite a lot of freedom to tweak instead of having preset resistance levels. The flywheel used is heavier than many other spin bikes, giving even more realism. Spin bikes are designed to imitate road bikes of course, having the same layout, so this is a pretty good way to simulate outdoor riding. This bike adjusts at the seat and handlebars, so your riding position can really be personalized to your overall build and limb lengths, rather than just your height. The Sunny Indoor Bike can be ridden by users from around 5’ up to around 6’8”, quite a wide range. Assembling the Sunny Indoor Cycling Bike is extremely simple. It comes with most of the frame already assembled, so there are only the attachments such as handlebars and pedals to be added on. This can be done solo in around 15 minutes and the instructions are super easy to follow. The bike is very sturdy with a full steel frame. The way the frame is constructed means there are no weak points, it’s as close to a single piece frame as you can get. It only has a 1 year frame warranty and 90 day parts warranty, but in our experience these don’t tend to break down much at all. The pads used in the resistance system will need replacing after a few years, other than this maintenance is minimal. With the ability to switch up through resistances easily, and a great magnetic system, this can be used for some incredibly tough workouts. Spin bikes become very hard to pedal at even a slow pace when the resistance is pushed right up. Magnetic resistance systems are real quiet, and this one’s no exception. It isn’t silent but it is quiet enough to watch TV or listen to music while using it – or even a conversation if you’re at the gym or have company. The magnetic system eliminates any clicking or clanging when changing resistance and can be done whilst still pedalling without any problems or jumps/jams. The Sunny Fitness Spin Bike has a kind of uncomfortable seat, like most other spin bikes. This is because the seat imitates a bicycle saddle, so it’s quite small and hard. Many users recommend adding a gel cover which they say makes it quite comfortable. Being a spin bike the Sunny Indoor Bike doesn’t come with many tech features. It doesn’t really need them either, though you could always use a tablet with guided video workouts or simulated rides to make this a better experience. For even shorter riders, you can either shorten the bar which the seat comes on or drill more holes. Be aware that these procedures require a little DIY knowledge and use of the correct equipment to be modified. If you can do that, it’ll be fine for shorter users, though without the tweaks the minimum height is probably around 5’-5’2”. The Marcy is a great little recumbent bike, perfect for home use. 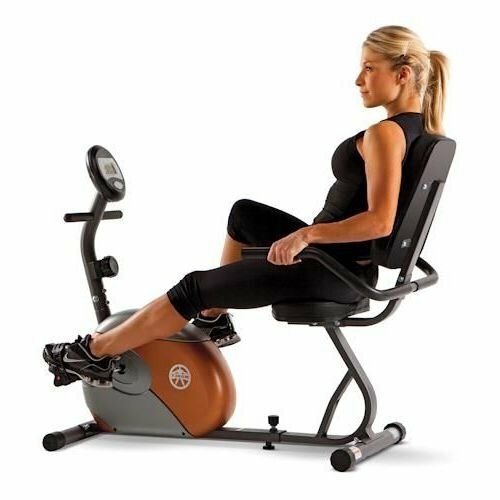 Recumbents are known to be the most comfortable type of exercise bike, with their bigger seats and more relaxed position. The compromise is that they don’t really work well with intense sessions. Still, the Marcy ME-709 Recumbent Bike is a great bike all around. For more recumbent bikes, check out our article on the best recumbent bikes available. Marcy produce a lot of good budget level home fitness equipment. The ME-709 is no exception, it’s a good bike at a great price. The way this is designed allows weight to spread well over the frame so it doesn’t wobble/tip. It’s got a total steel frame, though part is covered by plastic. There aren’t any issues with pedals or other parts either. A magnetic system is quiet and smooth, eliminating most vibrations and any loud noises. 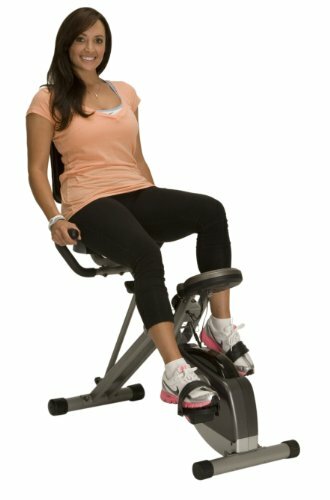 The Marcy ME-709 Recumbent Bike’s seat can be adjusted forwards and backwards quite a ways. There’s also an option to adjust the handrails/handles as well, giving a comfortable position for your build. It supports shorter users easily. Being a recumbent bike makes this super comfortable. The seat is a lot bigger and more padded than other types of exercise bike, but there are other recumbent bikes with even more comfortable and better padded seats. If you do want an even more comfortable seat, you can always purchase a padded seat cover. Recumbent bikes are great for less experienced exercisers, so having preset workouts is usually an advantage. This Marcy Recumbent Bike doesn’t have any workouts included though, meaning you’ll need to create your own for meaningful results. The display is a basic LCD unit which shows your speed, time elapsed, distance covered and the number of calories burned. They’re displayed clearly in large numbers, though this is as much info as you get. A great bike with a mid-range price tag, the Schwinn 130 Upright Bike is our best upright for shorter users. Not only is the seat position, so is the display, making it a great experience for all sizes. I should point out that unlike some Schwinn models, this one doesn’t support chest strap compatibility, which can lessen the effectiveness of its’ heart-rate based custom workouts. This comes with 22 preset workouts and has 20 different resistance settings. That’s a lot of variation in what you can do on it. It also has heart-rate based workouts which adjust to your level of cardiovascular fitness, helping you to maximize your potential and the improvements you get from training. These are all easy to navigate, making the 130 user friendly even for newcomers. The Schwinn 130 comes with a USB port which can be used to either play music through a device or USB stick, or it can be used as a charging port. In fact, it can even do both at once with the right device. There are built in speakers and a 3 speed fan to keep you cool. A drinks holder is included too. The bike can be adjusted quite a lot and is better for short to average sized people. Taller users might find this a bit awkward to get a good position with, especially those over 6’4”. Schwinn provide the 130 upright bike with a 10 year frame warranty plus 2 years on parts, 1 year on electrics and 90 days on labor. That’s a pretty solid all around deal. The pedals are the weak point of this design and they’re the one part which tends to break. Schwinn do have a good customer service team which, combined with the warranty, should fix your problems without much hassle. This can take over an hour to assemble despite coming partly pre-built, so keep that in mind if you do order one. Another bike that falls into the budget range, the Exerpeutic 400XL Folding Recumbent Bike is also a great way to save space in your home. It folds away for easy storage and doesn’t have a huge footprint when set up either. One again this is a bike which works well for average sized and shorter people, though taller users might struggle. The Exerpeutic Folding Recumbent folds away to a mere 54”x17”x20” and only takes up an area of 46”x19”x33” even when set up. The folding process is easy, just remove 2 pins and fold it, then replace the pins to hold in place. There are wheels on the bottom of the frame too, so it can be wheeled around easily. It comes in at the budget end of the price range. Having a semi-recumbent design allows the 400XL to have a bigger seat with back support, more like a chair than a bike. This and forwards leg position allows for more comfort than other types of bike. This uses a magnetic resistance system which is very smooth to move through and offers quick and easy resistance changes. There’s little vibration and not much noise from this bike. The Exerpeutic 400XL Folding Recumbent Bike comes with a basic LCD display. The display can show distance, odometer, time, calories, heart rate and speed. You can manually switch between displays or have them auto-rotate every few seconds. Some people don’t like the positioning of the display. Remember this is actually a semi-recumbent bike, so it doesn’t quite give the full recumbent position or the comfort which that would provide. Still, a fully recumbent bike would be difficult to make in a folding design, and this is more comfortable than a spin or upright bike. The 400XL also doesn’t come with any pre-programmed workouts, making it a bit more difficult for less experienced exercisers. Creating your own specific workouts beforehand is a great way around this. Overall these are all solid bikes, with some being better than others for short users. However I’m sticking by my original suggestion of the Sunny Health & Fitness Pro Indoor Cycling Bike. It gives a great workout and you can push really hard with it, though it isn’t the most comfortable option on this list.